Blog with news about the Houston, Texas, high-rise condominium and loft market. Wednesday, November 29th, 2017 at 1:26pm. Beautiful Rare Penthouse with stunning views!! Loft with 20 foot Ceilings, Hardwood Floors, Built-In Custom Storage/Closets, Track Lighting, Stainless appliances, Spacious and newly remodeled Bathrooms. 2 Car tandem Garage, View of Downtown Houston, HOA dues include trash, cable, exterior maintenance. Washington Lofts is a steel and concrete building, only 6 units per building, 2 per floor and no adjoining walls with neighbors. Walk to nearby restaurants, bike trails, close commute to downtown. Tuesday, August 1st, 2017 at 5:05pm. Randall Davis, the premiere condominium and high-rise developer of Texas, has been credited with redefining the Houston skyline, with bringing a new luxurious and hip flair to downtown developments and ultimately, with integrating contemporary loft-inspired living concepts into some of the city’s most historically entrenched areas and neighborhoods. With his latest ventures, Davis certainly does it again, providing prospective Houstonians with chic elegance and trendy, high-concept living. Arabella and Marlowe are truly taking a cue from Randall Davis’s past projects while bringing his development designs into even bolder territory. Tuesday, September 27th, 2016 at 11:23am. Chateau Ten West University is the newest mid-rise by renowned Randall Davis Co. With over 2600 square feet of living space, this 3rd floor ''Rand'' unit features 3 bedrooms, 3 1/2 baths, an open concept living with South and East views, and plenty of windows beaming with natural light. Meet with the design team to customize your unit. Features include Thermador appliances, Eggersman cabinetry, 4'' hardwoods, high ceilings, and semi-private elevator entries. Walkable to Rice Village shopping, restaurants and entertainment. 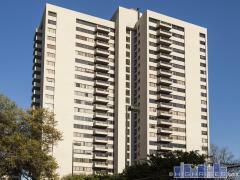 2506 Shakespeare Unit 303 is listed courtesy of Kristina Houston with New Leaf Real Estate. Monday, August 15th, 2016 at 4:50pm. Construction cranes are all over Houston, and new high-rises are going up from downtown to the Galleria. One of the newest to open is the Astoria, an exclusive luxury building by developer Randall Davis. Our partner agent, Kristina Houston, stopped by the building this week to check on a couple units and she took these photos. Join us as we take a tour of this amazing new building. Tuesday, May 19th, 2015 at 1:56pm. The high-rise condo lifestyle is catching on in some unlikely places, like the Woodlands - a suburban community north of Houston. The Woodlands is more commonly known for large houses on huge lots, but now they are getting a 23-story high-rise tower called Treviso at Waterway Square. It seems that even in areas where there is plenty of land to develop the trend is to go up and not out.